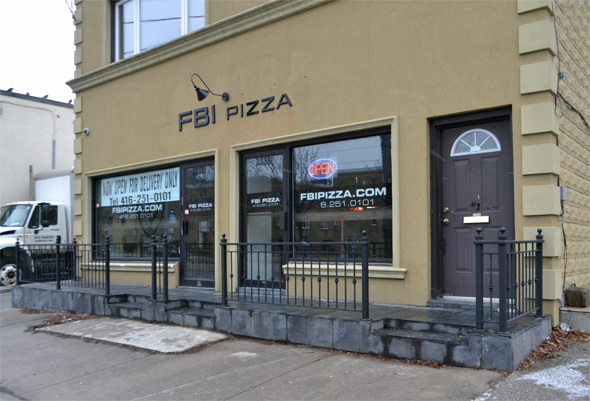 FBI Pizza might just be the answer to the prayers of the west ender who believes that Toronto is sorely lacking in quality delivery pizza options. Counting myself amongst this group, I was nearly ecstatic to learn that the folks behind Leslieville's Queen Margherita Pizza were set to open a delivery-focused sister restaurant in Mimico. Despite the rise of quality Neapolitan pizza joints in Toronto over the last few years, places like Pizzeria Libretto and Pizza e Pazzi don't deliver. Even if they did, the thin, flashed-cooked crusts that make these pizzas so good probably wouldn't fare so well soaking up steam for 20 minutes on route to your door. Not everyone will share my disillusionment with the city's delivery options. Even I'll admit that places like Vesuvio's , Buddha Pie and King Slice can turn out decent pies, but they all have their faults. 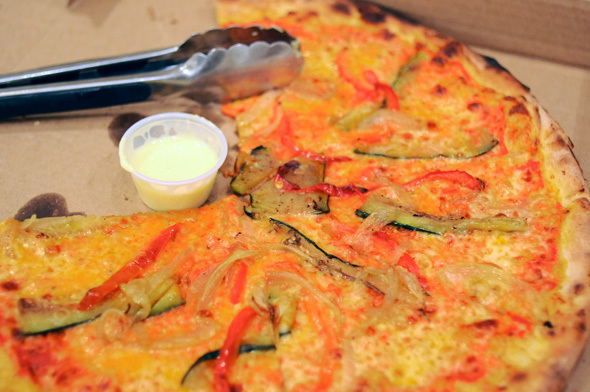 Vesuvio's tends to be light on sauce, Buddha Pie's crust can be bland and King Slice pushes the envelope on cheese levels. The latter isn't always a bad thing, but it underscores the lack of a solid all-around option — at least for folks like me who've sworn off places like Magic Oven and the commercial chains. That's where FBI Pizza comes in. Despite its ties to Queen Margherita Pizza, FBI (which stands for full-blooded Italian) serves a more hefty pizza that's better built to handle home delivery. Don't get me wrong, compared to many of Toronto's other delivery options FBI pizzas still have a relatively thin crust, but you can at least bring a piece from plate to mouth by gripping only the end crust. Available in two sizes — big ($9.95) and bigger ($13.95) — if one doesn't go bananas on toppings, the pizzas aren't particularly expensive either. 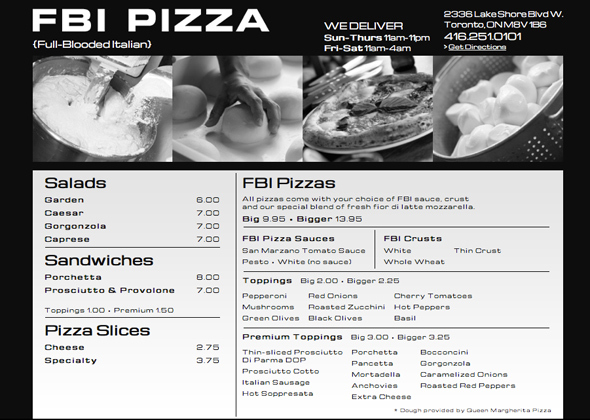 What sets FBI's product apart from its competitors for me is the quality of the ingredients, specifically the San Marzano based tomato sauce and the fior di latte mozzarella. I tend to keep things fairly basic as far as toppings go, which makes these base components even more noticeable. Those who are interested in what I might call fancier toppings will, however, be happy to see items like Prosciutto Di Parma DOP, Porchetta, Pancetta and Gorgonzola on offer. Each occasion that I've ordered from FBI (I'm up to three now), I've been thoroughly impressed by the balance the restaurant has achieved between a traditional Neapolitan pizza and the more doughy options that used to arrive at my door when ordering from elsewhere. The sauce has that ideal balance of sweetness and acidity, the cheese is creamier than standard mozzarella, and toppings like caramelized onions offer a subtle bit of sophistication that has me reaching for a wine glass shortly after opening the box. In other words, this is furtherest thing from Pizza Pizza that you could imagine. 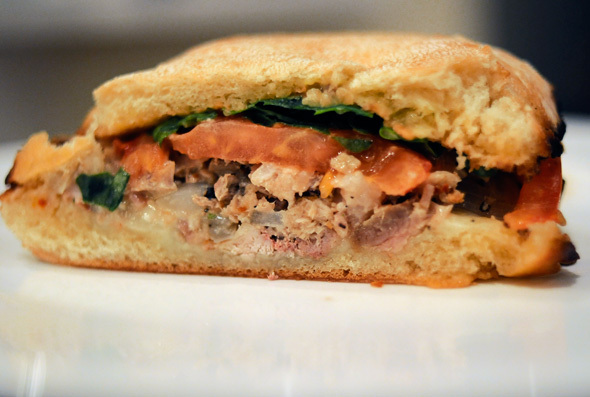 In addition to pizza, FBI offers Porchetta ($8.00) and Prosciutto & Provolone ($7.00) sandwiches. The former survives the the delivery process mostly intact, though slightly soggy. While not a standout to the same degree as FBI's speciality, the generous portion of pork is as moist as it should be and marked by a garlicky undertone that goes wonderfully with the Caesar salad. 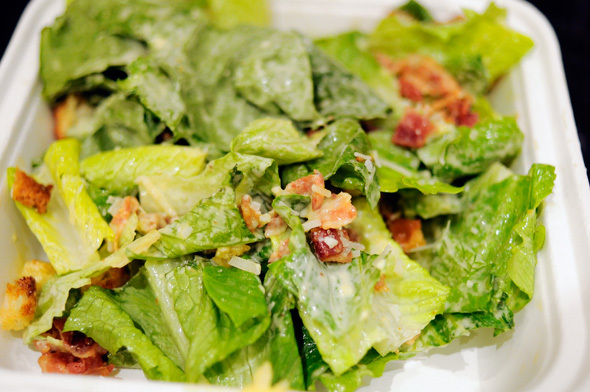 On the subject of salads, both options on the menu are solid accompaniments to the main fare — the real bacon in the Caesar is a welcome touch — but it would probably make sense to provide the dressing on the side rather than letting the greenery marinate during the trip to customers' homes. I suppose there is one big catch to all this, and that's the geographic limitations of FBI's reach. Located near Lake Shore and Park Lawn, the delivery range extends to an area in which the restaurant believes it can get an order out in about 45 minutes. Having recently opened, the exact coordinates are still TBA, but if you're east of Spadina and north of Bloor, then you're probably out of luck. Still, it's best to call and confirm just in case they're able to accomodate more easterly requests. 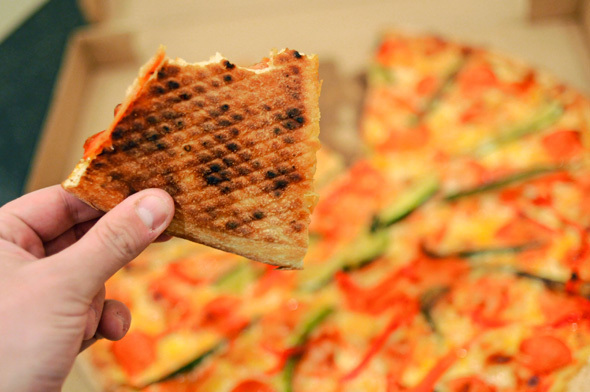 Given how good the food is, it might even be worth the trip to Mimico for east enders keen on trying out what is surely one Toronto's best new pizza options.